One of the things I’ve learned after nearly six years of marriage is that it’s not always perfect. It’s rarely the beautiful, singing-hand-in-hand-while-skipping-into-the-sunset sort of thing, despite what Hollywood would make you think. More often than not, marriage is a series of compromises, discussions, concessions, and sometimes full on pout-outs [primarily by the lady, I’m guessing] until you work through your issues and make it to the other side. 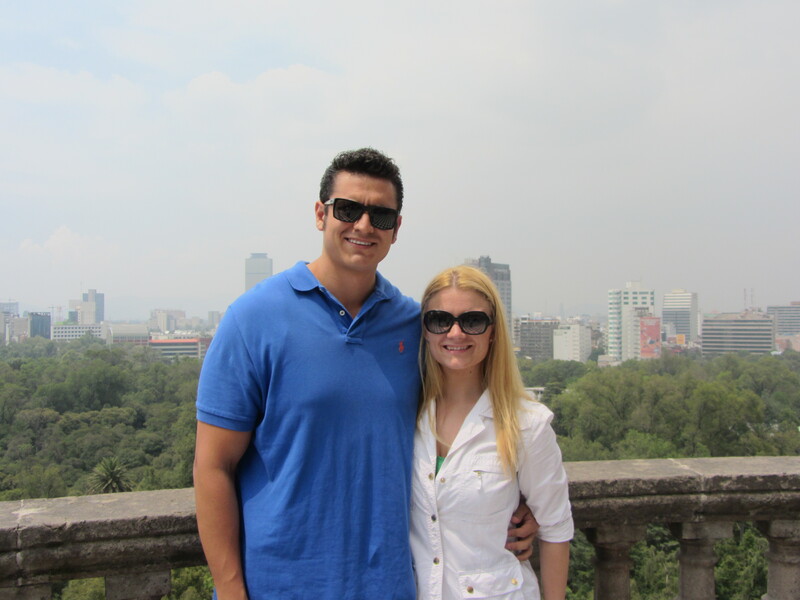 My husband and I in Mexico City, July 2012. My husband and I have been together since July 2003. In case you’re not good at math, that means we’re pushing ten years together this summer. That’s a LONG time, folks. More than one third of my life has been with the same man. How many people can speak to a ten year commitment? Few, especially in today’s day and age. Most people buy/sell their car every three years and their home every five to eight. I’ve been with my husband longer than most people live in their homes. WOW. That’s a crazy thought, considering most homes are easily over six-figures. So, what have we learned that has helped keep our marriage going strong for nearly a decade? Let’s talk about it. Saying “I’m sorry” – and meaning it – goes a long way. My husband and I are very different. We’re opposites in almost every way. He’s tall, I’m short. He’s a jock, I’m a book nerd. His idea of a good time is a basketball game and a pitcher of beer, whereas mine would be a night at the theater and a glass of wine. With that in mind, you can imagine that we don’t always see things the same way. Our opinions differ on many subject matters and, as a result, we can occasionally hurt one each other’s feelings, purely by not understanding their viewpoint. Being able to listen to one another and giving a true, sincere apology when we’ve caused the other pain has been the mortar holding the bricks of our marriage together. If we hadn’t mastered this skill early on, I doubt we would have gotten married in the first place. When I tell people that my husband and I schedule date nights, they laugh. They assume that since we live together and work for the same company, we must constantly be around one another. In some cases, they are right. Yes, I see my husband every day and for several hours at a time. However, there is a big difference between SEEING him and actually spending time with him. As a department supervisor for my company, I easily work 50+ hours per week. Add to that a full-time, accelerated school schedule and my independent freelance writing and there is barely a few hours per week to spare outside of sleeping and eating. My husband can be in the same room with me and I won’t even know he’s there, my brain is so congested with my to-do list. 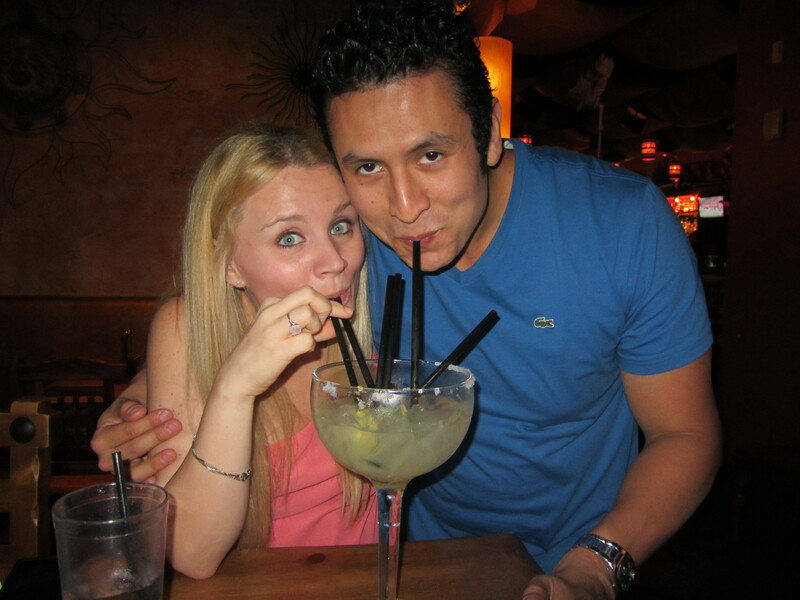 My husband and I sharing a margarita on his 28th birthday. Sharing is caring! With that in mind, I have to make a conscious effort to allocate time for US and to prioritize my tasks in such a way to ensure that nothing will disrupt that time together. Since these blocks of times are scheduled, it gives us both something to look forward to, just like our first dates in the early weeks of our dating. While it may not sound romantic to schedule time with my husband, it not only guarantees that we will have time alone – but it also makes the less exciting tasks, such as cooking dinner and washing up the dishes, more exciting because our anticipation for date night drives us forward. As I said before, my husband and I are opposites in nearly every way. Fortunately, it works well for us, as it allows us opportunities to take time alone, or with friends, and give each other the space that we need to refresh and rejuvenate. One of the unhealthiest things you can do within any relationship is smother the other person. I’ve personally watched new relationships crash and burn among my circle of friends because they began living exclusively for the other person. Remember: the other person wants to love YOU, not a mirror of themselves. If you latch on too tightly or try too hard to become a fan of everything that your spouse loves, you begin to lose your own identity, which is what attracted them in the first place! If you love opera and your husband does not [as is my case], find a friend to go with you! If your husband adores soccer and it bores you silly, let him go with his boys! You do not have to be glued at the hip to have a happy marriage. A certain amount of independence is a healthy addition to any relationship. Realistically, I could make this list much, much longer, but I’m sure no one wants to be preached to by a 28 year old woman about marriage. Once I’m in my 40s and broaching my 15th or 20th wedding anniversary, my advice will have a bit more weight. So, let’s leave it at this: if you love someone, truly TRULY love them, you’ll find that patience, compromise, and trust go a long way. ← Some days you’re the foot, some days you’re the ball. Your tips are amazing. Relationships take work. Date nights are so important and so is that simple word sorry. Thank you very much! 🙂 And you are absolutely right: relationships – of all kinds – require constant work. Whether it’s between a parent and child, a husband and wife, or two friends, it requires constant attention and effort to keep the relationship strong and secure. You got it! Brilliantly written. . My husband and I are approaching our 8 year wedding anniversary (this December). Space, trust and I’m sorry are the main pillars.